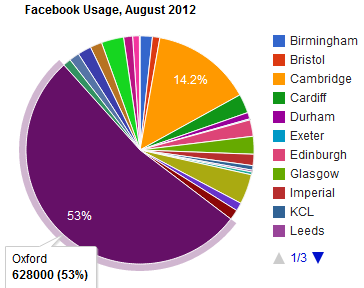 In order to gather evidence of use of Facebook in the higher education sector periodic surveys of usage of official institutional Facebook pages have been carried out for the Russell Group universities since January 2011. The last survey was carried out 0n 31 July 2012, the day before the number of Russell Group universities grew from 20 to 24. The aim of the surveys is to provide factual evidence which can be used to inform policy decisions on institutional use of social media and corresponding operational practices and stimulate debate. The latest survey has just been carried out. It is intended that the survey will help inform discussions at the IWMW 2014 event, which starts on Wednesday. Note that the data provided in the following table is also available as a Google Spreadsheet. The data for the surveys was collected on 11 January 2011, 25 September 2011 (estimate), 16 May 2012, 2 August 2012 and 14 July 2014. There has been a gap of two years before the latest survey. There are now 24 Russell Group universities as opposed to the 20 covered in the initial set of surveys. It should also be noted that comparisons of the numbers of ‘likes’ across individual institutions are probably not very meaningful due to the differing numbers of staff and students across the institutions. However the trends may be more meaningful. especially the trends across the aggregation of the institutions. The survey published on 2 August 2012 reported that the number of Facebook ‘likes’ for the 24 Russell Group Universities had exceeded 1 million for the first time. However as shown in Figure 2 over half of these likes were for the University of Oxford with the University of Cambridge being the next most popular: these two institutions represent 67% of the total. As can be seen from Figure 3 these two institutions have maintained their positions and now represent 65%. When Facebook was first launched access was restricted to approved institutions (which the University of Cambridge being the first in the UK to provide accounts for its students). In may 2007 John Kirriemuir felt that Something IS Going On With Facebook! after spotting weak signals of its potential importance. We then saw doubts expressed regarding its relevance for institutions characterised, perhaps, by the statement “stay out of my space“). However the popularity of the service led to suggestions that there was a need for an open alternative – but Diaspora was felt to have the potential to provide an open alternative, but as the post on Whatever Happened to Facebook-Killer Diaspora? concluded the answer was “nothing“. Now, it would appear, institutional use of Facebook is no longer a policy issue (should we have an account) but rather raises a number of operational issues to be addressed: How should we manage it? How much effort should we allocate to it? and what metrics should we measure to demonstrate the value we get from the service? Perhaps these are questions which will be asked at IWMW 2014 later this week. This entry was posted on 14 Jul 2014 at 12:15 pm	and is filed under Evidence, Facebook. You can follow any responses to this entry through the RSS 2.0 feed. You can leave a response, or trackback from your own site. What do we infer from these figures? As “evidence”, what are they “evidence” of? What does the fact that x people ‘liked’ institution A’s page and y people ‘liked’ institution B’s page tell me – other than “x people ‘liked’ institution A’s page and y people ‘liked’ institution B’s page” – given that the “likes” can originate from anywhere and a “like” can be a somewhat vague signal? Does it tell me about the “popularity” of the institution or the successful promotion of the institution’s Facebook presence? Is there any correlation with any other measures of “popularity” or “satisfaction”? I can’t help feeling a simple table of numbers of “likes” in itself doesn’t tell me very much. Thanks for the comments – and for point out the typo (now fixed). I would agree that the figures in isolation don’t tell us a great deal. In order to be meaningful there will be a need to have a contextual understanding of local factors, which I do not have. The aim of my periodic surveys is to help inform institutional understanding by providing figures which can inform discussions. This is part of the ‘open notebook’ approach I take on the blog (e.g. I try not to publish a finished infographic – such as the The Most Social Universities In The US (Infographic) but, instead, document the steps and invite comments). However although local knowledge is needed in order to have a deeper understanding (e.g. 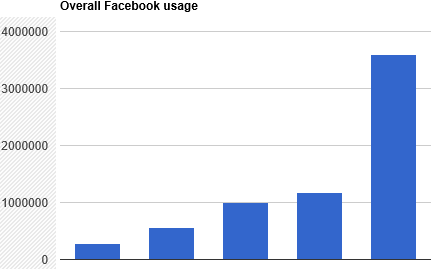 a strong growth may be based on to additional resources being provided to support use of Facebook) the data can help to provide indications of trends and comparisons with one’s peers.